The University of Oslo (Norwegian: Universitetet i Oslo), formerly The Royal Frederick University (Norwegian: Det Kongelige Frederiks Universitet), is the oldest and largest university in Norway, situated in the Norwegian capital of Oslo. The university has around 27,700 students and employs around 6,000 people. It has faculties of (Lutheran) Theology (Norway’s state religion since 1536), Law, Medicine, Humanities, Mathematics and Natural Sciences, Social Sciences, Dentistry, and Education. 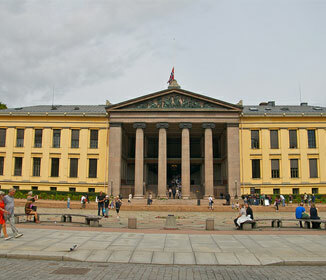 The university’s old campus, strongly influenced by Prussian architect Karl Friedrich Schinkel’s neoclassical style, is found in the centre of Oslo, near the National Theatre, the Royal Palace, and the Parliament. Today the old campus is occupied by the Faculty of Law, whereas most of the other faculties are located at the Blindern campus in the suburban West End, erected from the 1930s. 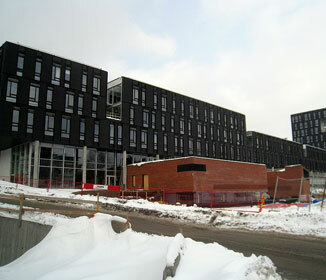 The Faculty of Medicine is split between several university hospitals in the Oslo area. The university was founded in 1811 and was modelled after the University of Copenhagen and also after the recently established University of Berlin. It was originally named after King Frederick VI of Denmark and Norway and received its current name in 1939. After the dissolution of the Dano-Norwegian union in 1814, close academic ties between the countries were nevertheless maintained. The University of Oslo was the only university in Norway until 1946, and hence informally often known as simply “universitetet” (“the university”). It was also informally referred to as “The Royal Frederick’s” (Det Kgl. Frederiks) for short. The University of Oslo is home to five Nobel Prize winners. One of the Nobel Prizes, the Nobel Peace Prize, was awarded in the university’s Atrium 1947–1989, thus making the University of Oslo the only university to host a Nobel Prize ceremony. Since 2003, the Abel Prize is awarded in the university’s Atrium.